There are at least 40 baby name books currently listed on Amazon, touting upwards of 10,000, 50,000, even 100,000 names, so one can’t fault an author for trying to find a new angle to stand out from the pack. 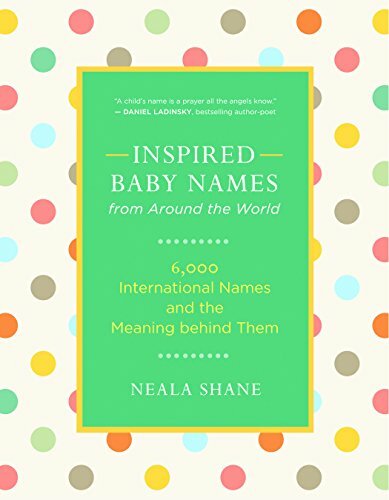 From the title of Neala Shane’s Inspired Baby Names from Around the World: 6000 International Names and the Meaning Behind Them, one gets the impression that the focus is on international names. As the author points out, today many Americans “choose names that relate to their cultures and countries of origin. . . people are reidentifying with the names and original spellings of “the old country.” So a baby name book with an international bent should certainly have a contemporary appeal. Unfortunately, this book’s focuses on inspirational “hooey” lessens that appeal. On a scale of 1–10, the hooey factor of this baby name collection is a solid 9. In addition to the baby names’ meanings, origins, and pronunciations, the author (who holds a BA in religious studies) has included a chapter on meditation technique for finding one’s baby name, and also offers a “spiritual affirmation” for each and every one of the over 6,000 names listed in this collection. These affirmations, or blessings, were carefully selected by the author based on “The most dominant spiritual expression of the culture,” and come from famous authors, philosophers, historical figures, and religious scriptures. But what these spiritual affirmations really are is unnecessary. Assigning a blessing to a baby’s name, unless done so by a spiritual leader such as the Pope or the Dali Lama, comes across as hubris on the part of the author and takes away from the legitimate and interesting meanings of the names. Perhaps more helpful to a parent-to-be would be a quote specific to the name (if such a quote exists), or an example of the name used in a song lyric or poem, or a list of famous or historical figures who share a particular name. Because the book title claims an international bent, one would expect the entire book to be divided by country/region. Instead the names are simply broken down alphabetically by traditional male/female assignments. But what is helpful and interesting are the lists of the most popular names by decade, a 28-page names-by-meaning index, and a 13-page names-by-ethnicity index. There are certainly quite a few unusual sounding and beautiful names in this collection, such as Bram, Isidore, Laniloa, Rasin, and Kupenda, and that alone might justify the purchase. But with so many other baby name books on the market and so many baby name lists available for free on the Internet, the “inspiration” in Inspired Baby Names from Around the World might make this collection too much of a turn off for some.